A persons skin can scar due to many different conditions or problems. 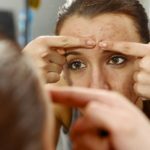 Severe acne causes inflammation and may result in scarring of the skin over time. Any type of force or trauma to the skin can also cause scarring if it is severe enough to disrupt the network of collagen below it’s surface. Although scarring does not cause any health risk, the aesthetic result can be quite detrimental to the psychological well being of the patient. 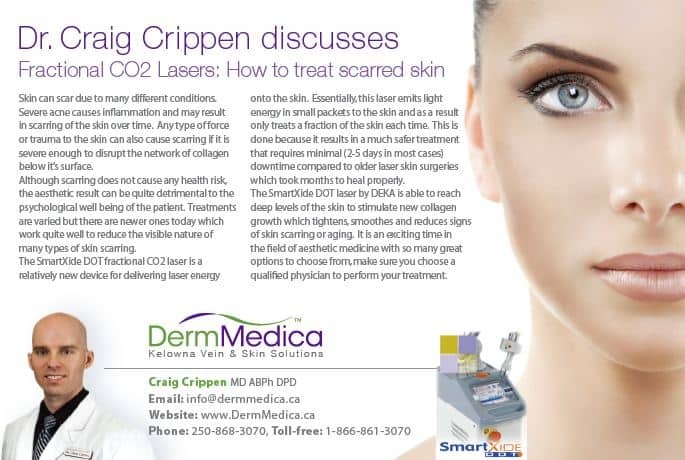 Treatments available today are varied and what you get depends on what clinic you visit and the physicians experience, but there are exciting new lasers today which work quite well to reduce the visible nature of many types of skin scarring. The SmartXide DOT fractional CO2 laser is a new device for delivering laser energy onto the skin. Essentially, this laser emits light energy in small packets to the skin and as a result only treats a fraction of the skin each time. 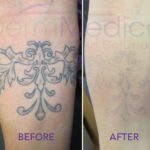 This is done because it results in a much safer treatment that requires minimal(2-5 days in most cases) downtime compared to older laser skin surgeries which took months to heal properly. The SmartXide DOT laser by DEKA is able to reach deep levels of the skin to stimulate new collagen growth which tightens, smoothes and reduces signs of skin scarring or aging. It is an exciting time in the field of aesthetic medicine with so many great options to choose from, make sure you choose a qualified physician to perform your treatment.